Students in Cowley College’s Phi Theta Kappa organization recently attended a Leadership Conference and Hallmark Writing Workshop in Wichita at Newman University. Officers Samantha Twenhafel, Hannah Twenhafel and Tabitha Slater, along with member Aishah Alhomsi and advisor Deborah Layton met the regional officers and the international organization president, Yanik Etan, while attending general sessions led by those individuals. Students were introduced to the regional and national goals as well as recruitment strategies, fundraising ideas, the chapter development plan and officer benefits; in addition, they learned about the $90 million in scholarships opportunities through the organization. Candice Eldridge from the Texas Alumni Association conducted the last general session entitled “Phi Theta Kappa Passion” about her many years of experience and personal benefits of being with the nationally recognized honors organization. Ms. Eldridge also lead the writing workshop, which consisted of instructing students on writing a vitae, applying for scholarships and writing for the Hallmark Awards that garner regional and national acknowledgement. The conference was not all work, however. Students enjoyed the fellowship activity offered at The Alley on Friday night too. 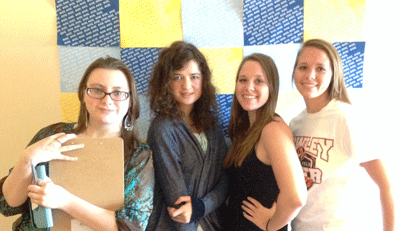 Those pictured are, from left, Aishah Alhomsi, Tabitha Slater, Samantha Twenhafel and Hannah Twenhafel.